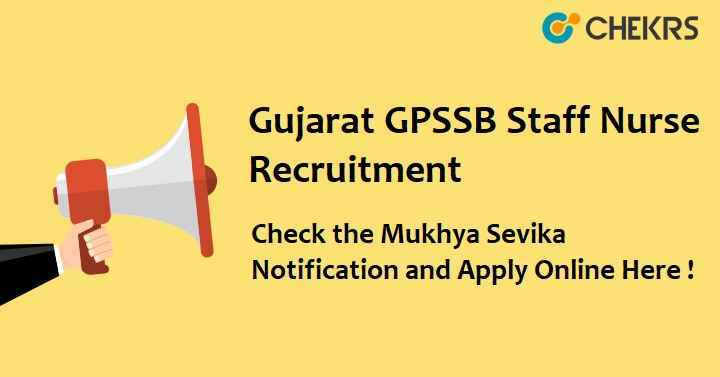 GPSSB Recruitment 2018: Gujarat Panchayat Seva Selection Board has rolled out a new notice regarding the job vacancies available for the posts of Staff Nurse and Mukhya Sevika. Interested candidates must check their eligibility from the GPSSB Mukhya Sevika Vacancy 2018 Notification and then apply for the available Nursing Jobs before the deadline. Maximum Age: 35/ 40 yrs. All the interested candidates are required to confirm that whether they fulfill all the necessary eligibility criteria or not and then only proceed to apply for the GPSSB Staff Nurse Vacancy. Visit the official web page of GPSSB. Then, select the recruiting department and move further. Now, select the post name and click on the apply link. You need to register yourself there for the first time. Then, enter the login details. Now, fill up the details in the GPSSB Mukhya Sevika Online Application Form. Verify the details and submit the form. Remarks: You can leave your queries related to the GPSSB Recruitment 2018 in the comment box. Also, share your reviews with us. Tags:Apply Online, GPSSB, Gujarat, Mukhya Sevika, Recruitment, Staff Nurse, www.ojas.gujarat.gov.in.